The rig locking system is hydraulically driven and can be configured to work with any rig jacking systems of the jack up rig to perform the rig locking and the load transfer operation. It is designed in compliance with the rules of ABS, DNV, BV, Lloyd's Register and CCS rules. The rack locking systems are arranged in opposing pairs against the leg rack. 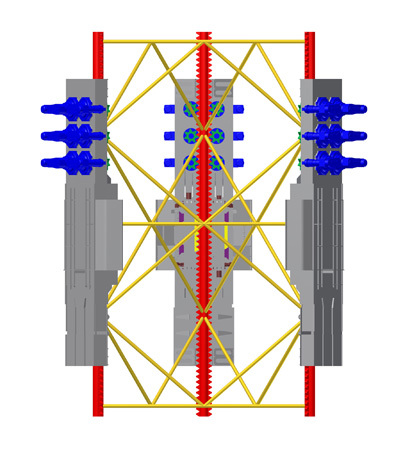 The components of the rack locking systems are housed within the lower section of the jack frame structure. Operation of the rack locking systems will be from the local control console located beside the leg well on the main deck. SOE supplies a range of models for rack locking system.Refer to the following table for detail technical data. Note: Customised designs are available upon request.